To all you mac users out there I (as a mac user myself), though I'd post for you a few great sites for getting your hands on the best freeware and opensource software - the best resources I have come across all in one post, so here you go. I Use This - A comprehensive software listing of what's new in all areas of software - site depends on entries from users also, create an account add apps that aren't there and keep track of all the apps you use on your mac. The Free Mac Classroom - An extensive list of freeware and opensource software for your mac, aimed at (as the title suggests) students who need software on the cheap, it is also a greatly valuable source for all the rest of us mac users too as it lists software most would not think available. The list isn't exhaustive at all, so if you know of some freeware that could be usefull in the workplace, classroom or other you can let the author know of them so they can be made available to other users. 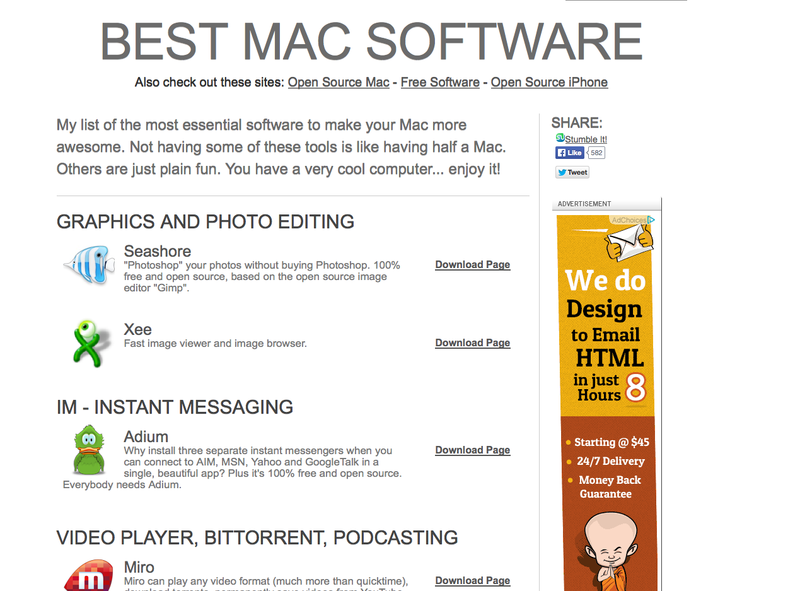 Mohawke's Best Of The Best - another comprehensive site with not only mac freeware and opensoure but a windows list too along with a couple others, worth checking out - some software may be obsolete or changed name but this is a good resource. Downloadpedia specifically sections Best Mac Software and Open Source Mac. This also has Linux and Windows section along with Firefox and Thhunderbird add-on sections. Open Source God | Mashable - 480+ Opensource applications and resources. Free and Open Source Software Directory - Webi - Categorized opensource software applications and games. Well, there you go, enjoy! No Comment to " My Recommended Resources For Freeware On Your Mac "